Orchids are loved by gardeners around the world but are notoriously difficult to cultivate. Japanese researchers have developed a new orchid cultivation kit that allows seed germination, flowering, and fruiting, and have succeeded in the complete artificial cultivation of an autonomous orchid. Since this kit can be made from materials costing only a few dollars, it can broaden the range of opportunities for orchid cultivation in general households. It is also expected to be a useful tool for preserving the genetic diversity of orchidaceous plants, many of which are in danger of extinction. Myco-heterotrophic plants germinate and grow through a symbiotic relationship with mycorrhizal fungi. The fungi coexists on the plant's roots where it is supplied with sugar, and the plant receives energy from the fungi rather than through photosynthesis. Orchidaceous plants fall into the myco-heterotrophic plant group. Orchidaceae plants have unique shapes, reproductive styles, and highly diversified ecological features. Unfortunately, many species of this plant group are on the verge of extinction. Plants that require symbiotic bacteria, like Orchidaceae, are difficult to germinate and cultivate in an artificial environment where symbiotic bacteria are less likely to be present. In general, orchid breeding is done by buying seedlings, but it can sometimes take years before they fully flower. In addition to the labor, orchid cultivation often requires the use of a greenhouse, giving the plant an image of only available to relatively wealthy people. Additionally, obtaining orchid seeds is challenging and, even if seeds can be acquired, orchid seed germination in an ordinary household is extremely difficult. 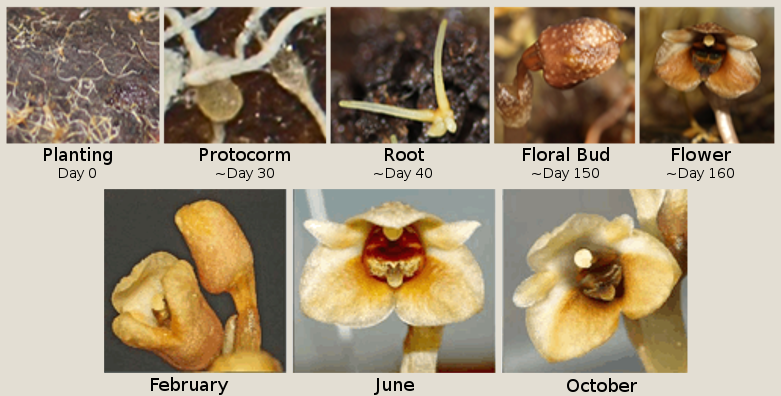 For this reason, there are not many people in the general population who have experience germinating orchids to the flowering stage. Moreover, the efficiency of artificial cultivation is expected to help with orchid seed conservation. Orchids are the most species-rich gardening plants in the world, and in the Japanese prefecture of Kumamoto, three kinds of Gastrodia orchids grow naturally. Scientists at Kumamoto University originally developed a cultivation kit to culture and identify mycorrhizae, fungi that have a symbiotic relationship with many plants and are necessary for cultivating orchidaceous plants in the laboratory. They quickly found that the kits provided an excellent habitat for the three Gastrodia orchids native to the area. The new "Orchid Cultivation Kits" are made by simply placing detritus (fallen trees, cones, leaves, branches, and mulch) collected from areas where orchids are found into a plastic case and covering the concoction with a lid. Researchers cultivated Gastrodia orchids from seeds using this kit, thereby confirming that the plants can be fully grown artificially from germination to flowering and fruiting. Cultivation efficiency with the kit is extremely high, with some seeds that normally germinate little in the field germinating with almost 100% probability when using the kit. In the case of the Gastrodia pubilabiata orchid, the researchers saw the plant successfully grow from seed to flower three times in one year. The cultivation kit can maintain higher humidity levels since it is a closed plastic container. It is thought that the high efficiency of the kit was due to mycorrhizal fungi that adhered to the items collected from the natural orchid habitat, which had a favorable effect on the growth of Gastrodia orchids. Indeed, the same mycorrhizal fungi identified from decomposing trees harvested from the original orchid habitat were also detected in growing orchids; clearly the fungi and Orchidaceae were symbiotic. It is thought that the combination of high humidity levels and environment that includes mycorrhizal fungi is indispensable for efficient orchid germination and growth. "Since our orchid cultivation kit is a very simple system, anyone should be able to artificially cultivate the plants anywhere," said Professor Shinichiro Sawa of Kumamoto University, who directed the kit's development. "By further customizing this system, we expect that the artificial cultivation of various fungal heterotrophic plants will become simplified and highly efficient. Not only do we expect to commercialize the cultivation kits domestically, but we also hope to see it used in a wide range of applications from the conservation and growth of endangered species to the cultivation of medicinal plants."